Spring 2018 was one of the hottest markets in SF and the Bay Area in the last 2 decades. Then the market began to cool in summer and autumn – demand, sales and appreciation rates generally dropping, while supply and price reductions increased – before the mid-winter doldrums took hold. The magnitude of these changes varied by county, with SF less affected than many others, but still certainly affected. Since the recovery began in 2012, spring has typically been the most active season of the year, and usually the period during which appreciation gains have been the largest. The spring 2019 market is just getting started amid a diverse set of economic indicators. Financial markets have, so far, recovered in 2019, interest rates have dropped, and big local IPOs loom. We will know much more soon. Looking at 3-month rolling median sales prices, the SF median house price was virtually unchanged on a year-over-year basis, while the median condo price (second chart below) ticked up a little – but the critical issue is what will happen in the spring months, when sales volumes are much higher. Markets appreciate due to a wide variety of local and macro-economic reasons: economic cycles, industry booms, inflation, consumer confidence, interest rates, employment, gentrification, new construction, comparative affordability (to other nearby markets), population growth, buyers’ median age, commuting, fashion, and so forth. The combination of factors affecting any particular neighborhood or district in the city is often specific to that market. In SF and around the Bay Area, more expensive homes have generally appreciated less than more affordable homes, especially over the last 3-4 years. On the other hand, during the last downturn after 2008, the prices of more expensive homes usually declined significantly less. These appreciation percentages should be considered very approximate. The number of active listings fluctuates daily, and the numbers below are increasing as more new listings come on market. These next 3 charts are snapshots of active listings on March 1st. The supply of listings available to purchase varies widely between city districts, which can be a simple reflection of market size and/or an indicator of supply and demand dynamics. If median LIST prices (below) are well above 2018 median SALES prices (delineated earlier in this report), it is typically a sign that the balance in listings for sale is disproportionately weighted towards higher priced properties, where demand is softer – and/or a sign of overpricing beyond what buyers consider fair market value. New inventory usually starts pouring into the market right now, in early spring, to fuel the biggest selling season of the year. The number of sales in the first 2 months of 2019 was down from the same period of 2018, but these are the 2 lowest sales-volume months of the year. A much more significant indicator will be what occurs over the next 4 months during the classic spring selling season. Sales are a somewhat lagging indicator, as they mostly reflect new listings and accepted-offer activity in the previous month or two. In SF and around the Bay Area, higher-priced areas have generally had somewhat cooler markets than more affordable markets in recent years, which is reflected in the next 4 charts. But home price is certainly not the only factor at play in these different neighborhoods. Any percentage over 100% reflects overbidding of asking price. Though these percentages have declined somewhat in the past 6 months, they are still incredibly high compared to most other places in the Bay Area and the U.S.. 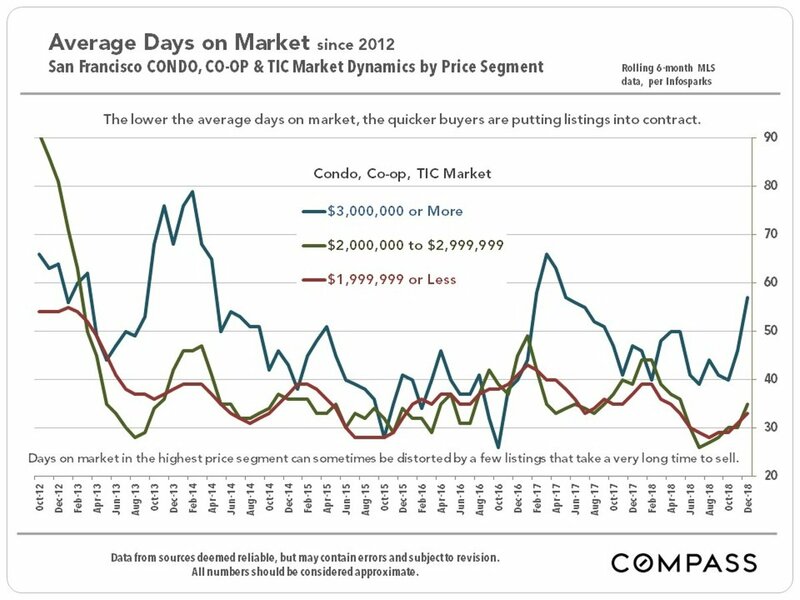 Unlike the house market, various city districts have seen high volumes of newly constructed condos in the last 3 to 4 years, and the increased supply has affected the condo markets in those areas. On a quarterly basis, the highest median house sales price in the Bay Area has been alternating between San Francisco and San Mateo Counties. The statistics in this report are very general and approximate indicators based upon listing and sales data pertaining to assortments, of varying size, of relatively unique homes across a broad spectrum of locations and qualities. How these statistics apply to the current value, appreciation trend, and prevailing market conditions of any particular property is unknown without a specific comparative market analysis. In recent years, house price appreciation has far outpaced that of condos. Appreciation percentages can change rapidly in these year-over-year comparisons. In Pacific Heights, a neighborhood of big, very expensive houses, both median sales prices and average dollar per square foot values (illustrated below) have dropped from peaks hit in 2015- 2016.